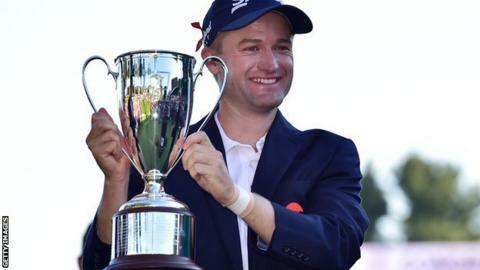 Scotland's Russell Knox won the Travelers Championship after Jim Furyk became the first player in PGA Tour history to shoot a round of 58. Knox, 31, closed with a two-under 68 to beat Jerry Kelly by one shot. Daniel Berger went into the final round as leader but carded a four-over-par 74 to end tied for fifth with Furyk, Robert Garrigus and Tyrone van Aswegen. American Furyk, 46, carded 10 birdies and an eagle in his bogey-free round of 12 under par to finish on 11 under. Knox, who also won in Shanghai in November 2015, becomes the fifth player to have multiple wins in the 2015-16 PGA Tour season. The others are the current top three players in the world - Jason Day, Dustin Johnson and Jordan Spieth - and world number eight Adam Scott. The victory lifts the Scot into contention for at least a wildcard place in the European Ryder Cup team for the biennial tournament against the United States, which takes place at the end of September. "It's been an incredible year for me," said Knox. "I keep believing in myself, I tell myself every day that I'm good enough to be up there and win tournaments. It's been an enjoyable ride." Set to move inside the top 20 in the world rankings, he added that winning this tournament would make it difficult for European captain Darren Clarke "not to pick me". Furyk, who was already one of only six men to have recorded a score of 59 for 18 holes, said: "A million and a half rounds played in the history of the PGA Tour and you look at the great names ahead of me. "It's humbling. To stand alone at 58 is really a cool accomplishment." Can Knox make Europe's Ryder Cup team? Read more on Ryder Cup: Can Darren Clarke find space for Russell Knox in European team?